I’ve never written about a horse winning the Triple Crown before. Writing this article makes you think: how many Triple Crown winners are going to cross my professional path? I could be writing the next one from a rocking chair on the porch, or maybe I'll never have another chance. So this had better be good. But like everything else he does, American Pharoah is making it easy for me. One of his feet was injured badly enough to keep him out of the Breeder’s Cup last year, so you would think there’s plenty to write about. And yet there’s nothing really to write about because, as we all saw on Saturday, he’s sound enough to put on an exhibition of exhilarating runaway racing for a mile and a half on one of the deepest, widest tracks in the world. There’s nothing but there’s something. Whether it’s painful or not, a “bruise” in American Pharoah’s left front foot became obvious on October 27 last year and forced his withdrawal from the Breeders Cup Juvenile. 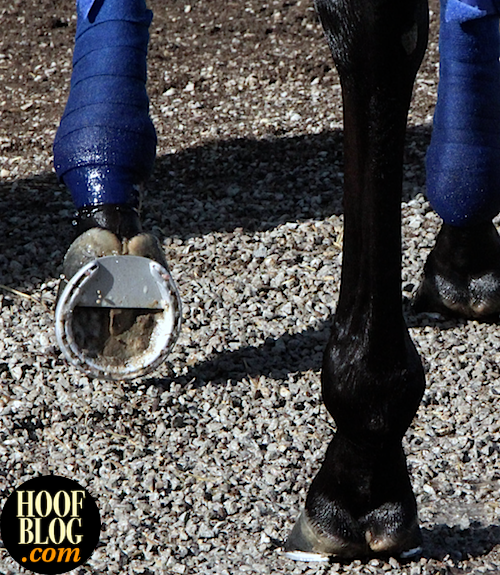 Since then, his left front has been shod with a plate riveted to the entire foot surface of a normal raceplate. the horseshoer for Triple Crown winner American Pharoah. American Pharoah is one of 15 or so “special need horses” that California trainer Bob Baffert entrusts to problem-solving horseshoer Wes Champagne, who kindly provided an interview mere hours after learning that he is only person on the planet who can say he shod a Triple Crown winner for all three of the races. Wes is known for his work with adhesives and glue-on shoes and his ability to patch quarter cracks. His client list includes some of the most famous racehorses in North America. In 2013, he reset the meter for hoofcare education with the introduction of his “Blacksmith Buddy”, an innovative horseless horseshoeing stand that simulates a horse limb and hoof and allows people to practice or demonstrate shoeing or trimming skills on a removable hoof capsule. 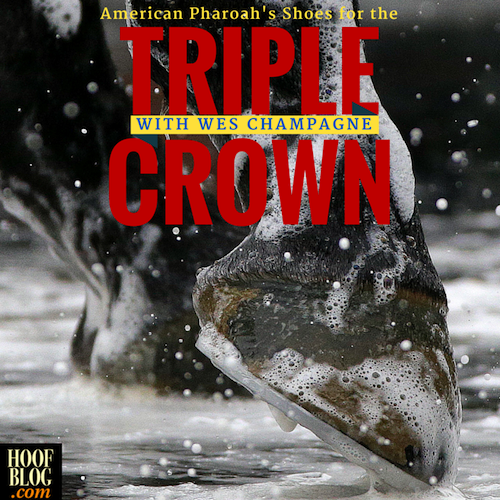 But even Wes Champagne had never shod a Triple Crown winner before. American Pharoah was added to Wes’s list in the Baffert barn at Santa Anita after he showed signs of the foot bruise in October. Wes said that he has managed the foot with the same basic design, although he varies how the shoe is constructed. 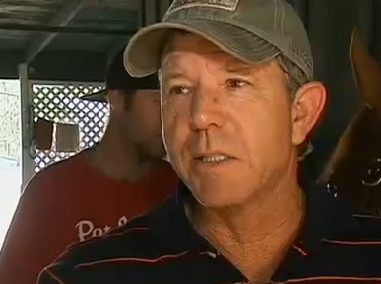 Whether the horse is wearing a plate that is "egged out" with more support depends on the race schedule, Wes said. “Racing in the Kentucky Derby with 20 other horses can be rough,” he said, explaining how the horse raced in the Derby and Preakness with an open heel version, which was applied in Louisville on April 28, in the event he might have been stepped on, or tangled with others. Will this design come to be known as a "Pharoah plate"? He wasn’t concerned about the horse wearing the plate on only one foot. “I’m not one of those who worries about balancing out the two front feet with the exact same shoes,” he explained. Wes returned to Kentucky on May 28 to re-shoe the horse before he left for New York and the Belmont Stakes for the final leg of the Triple Crown. So: what sort of interesting or high-tech shoes was the Triple Crown winner wearing? Except for the little heel plate, the front shoes for the Derby and Preakness were standard, average, universal Queen’s Plate XTs made by Thoro’Bred Racing Plate Company of California. He would have been wearing a “low toe” in front, but they are not allowed at Churchill Downs. Wes said that the horse could have been re-shod with low toes for the Preakness at Pimlico, but the decision was made to leave him alone, since he had run just fine in the Derby and was training well. For the Belmont, American Pharoah was wearing the low toe model by Thoro’Bred. In all three races he wore plain hind plates. "This is not rocket science," you’re thinking. No adhesive, no wings, no dual-density support material, no poly-anything. No vials, cups, or tongue depressors. No Dremel tools, no plastic wrap. No syringes, drains, or cross-fibered fabric. Most people spend more on lunch than the raw materials cost to set up this horse*. But this is horseshoeing, and you should never judge a horse’s shoes by looking at them--or their price tag. Yes, his shoes look like the same shoes half the horses running at American racetracks wore on Saturday afternoon, but sometimes rocket science is in the mind of the horseshoer, and it’s not visibly written in the shoes. You’d have to pick one of these shoes up to notice the difference. Wes Champagne de-tempered the shoes before nailing them on. You’d probably be able to flex it with your hands. “I take the temper out of the shoes so they’re not so rigid,” he explained, comparing the de-tempered aluminum raceplates to the desirable flexibility of a plastic EasyShoe or urethane Polyflex shoe, which give the foot additional and separate vertical flexibility in the heels. Disadvantages to a de-tempered shoe might be that some feet might spread with the shoe if it spreads, but Wes said that that was preferable to holding it too tightly. American Pharoah walked across crushed stone at Churchill Downs May 26th, two days before he was re-shod for the Belmont Stakes by Wes Champagne. Here you see the plate and shoe worn in the Kentucky Derby and Preakness. It conforms conservatively to the arc of the heels of the flat Queen's Plate XT and is not "egged out" as some versions have been. A similar shoe, but with a "low toe" (toe grab) was worn in the Belmont. Photo © Associated Press / Cal Sport Images, used with permission. Wes’s job for the next four months will be to keep American Pharoah in shoes, which will be as soft or hard as he needs to prepare for his ultimate showdown on October 31 against older horses in the Breeders Cup Classic at Keeneland Racecourse in Kentucky. Should he win there, it would be like winning the Grand Slam: the Triple Crown and the Breeders Cup Classic in one year would mean defeating his own age and older horses as well. And it’s never been done. In fact, no one has ever even tried it, since the Breeder’s Cup began after Affirmed won the Triple Crown in 1978...and no one has won it since, until now. You can be sure that this horse will become a sports celebrity with a publicity machine. The public will want to know what he had for lunch and who makes his coolers. Now the world knows what company makes his shoes and which professional racetrack horseshoer nails them on and takes extra care to protect that bruised left front as it heals. They also know his hooves are in good hands. Congratulations to everyone, especially Wes Champagne, who has had a part in this horse’s upbringing, training or care, and thanks to Bob Baffert and Zayat Stable for sharing him with the world. Thank you, most of all, to American Pharoah himself, for making us all believe again. * Cost of shoeing materials for American Pharoah retrieved via harrypatton.com of Monrovia, California. Sign up for email headlines from the Hoof Blog! 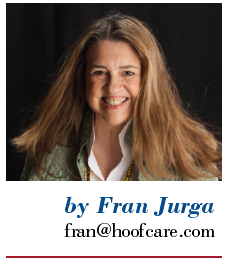 Great article Fran! I'll be sharing on my FB pages as I have a horse that Dr. Jody Wagner of Coosa Valley Equine Center in Birmingham, AL prescribed and almost identical shoe for. Mark Rikard. I think most people would put the heel plate in and them make a rim pad of some type, or use a readymade spider-type plate. I thought he really went the extra mile (and a half) for this horse. Very nice article Fran. I don't think the race track farriers ever get enough credit. Thanks for doing it. How nice of you to mention that, Barry. I agree, although I tend to think that farriers in general don't get enough credit. While they may downplay the horse's injury and need for the shoe, I'm sure it made a big difference to the confidence level of all involved for the horse to have stayed sound all through the campaign. And they can thank having Wes on the team for that. Thanks for checking in, Barry. Come back soon! Brilliant, brilliant. Fascinating, enlightening, and as always perfectly written. Knowing you, knowing Wes, now I get to know about the horse and how this extraordinary farrier is keeping him sound. Thank you, Fran.